You’re probably wondering if my title for today’s post makes any sense, and it does, but to me. See, I had a countdown going on for my trip to see the show, Dirty Dancing, tonight. I’m looking forward to my evening out despite the rain. As regards to the other countdown that’s still going on, that refers to my Thank You cards. I have done (and tried really hard) to design and post a Thank You card everyday this year. It hasn’t been easy, but I have kept on moving along with determination and fight. Plus, it’s turned into a habit that I can’t break just yet. And don’t ask if I’m going to do something like this again next year, because at the moment, I just don’t know. There have been good and bad things about doing this design challenge and blog, and I’m just not yet sure if it’s worth my time, blood, sweat and tears. Or, if I should just stop. Guess we’ll found out next year. Anyhow, onto the card which is inspired by calendar blocks. Years ago, a good friend gave me a set of calendar blocks and I change the date every day. It’s a habit so I know what day it is, but don’t ask me the name of the day because I woke up today thinking it was Monday. Go figure. Anyway, someone actually made their own from scrapbook paper and numbers and I really liked their design. So, I morphed their design into a Thank You card for today. It’s got a retro / shabby chic / country kind of vibe all rolled into one. I can’t really explain the design concept, but I’ll show it to you instead. 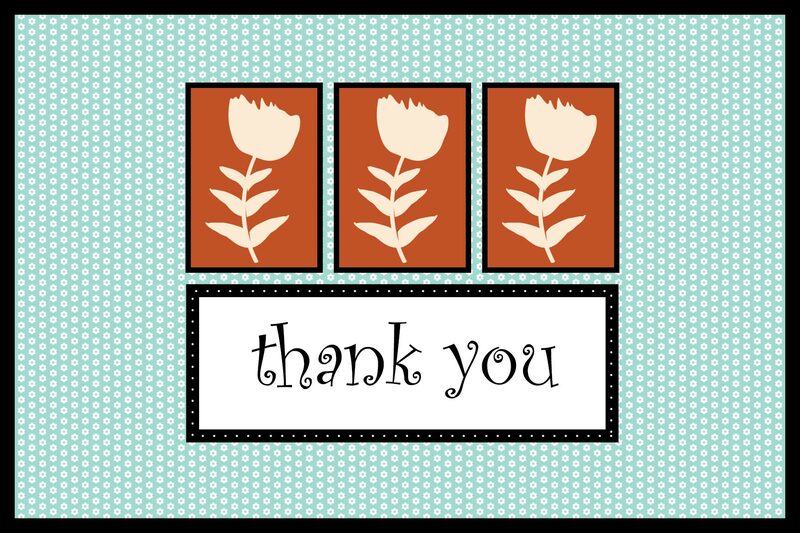 This entry was tagged black, blog, blogs, card, cards, colorful, colors, design, flowers, graphic design, orange, pattern, patterns, retro, retro and vintage design, retro design, Thank you, thank you blog, thank you card, thank you card blog, thank you cards, white. Bookmark the permalink.